Noncompliance with a runway holding position marking may result in the FAA filing a Pilot Deviation against you. 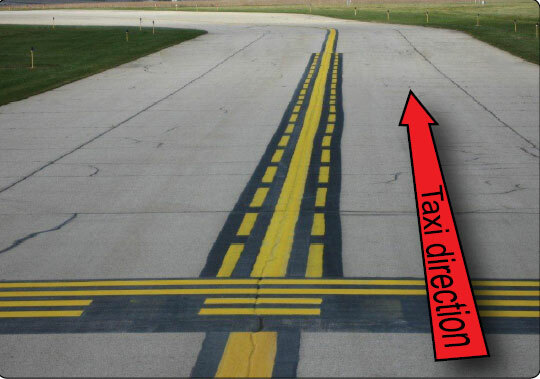 Runway holding position markings consist of four yellow lines, two solid and two dashed, that are painted on the surface and extend across the width of the taxiway to indicate where the aircraft should stop when approaching a runway. These markings are painted across the entire taxiway pavement, are in alignment, and are collocated with the holding position sign as described above. As you approach the runway, two solid yellow lines and two dashed lines will be visible. Prior to reaching the solid lines, it is imperative to stop and ensure that no portion of the aircraft intersects the first solid yellow line. Do not cross the double solid lines until a clearance from ATC has been received. [Figure 14-13] When the tower is closed or when operating at a nontowered airport, you may taxi onto or across the runway only when the runway is clear and there are no aircraft on final approach. You should use extreme caution when crossing or taxiing onto the runway and always look both ways. Figure 14-13. 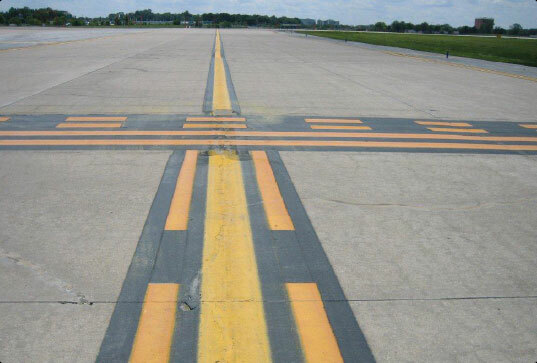 Surface painted holding position marking along with enhanced taxiway centerline. When exiting the runway, the same markings will be seen except the aircraft will be approaching the double dashed lines. [Figure 14-14] In order to be clear of the runway, the entire aircraft must cross both the dashed and solid lines. An ATC clearance is not needed to cross this marking when exiting the runway. Figure 14-14. Runway holding position markings as seen when exiting the runway. When exiting the runway, no ATC clearance is required to cross. Runway distance remaining signs have a black background with a white number and may be installed along one or both sides of the runway. 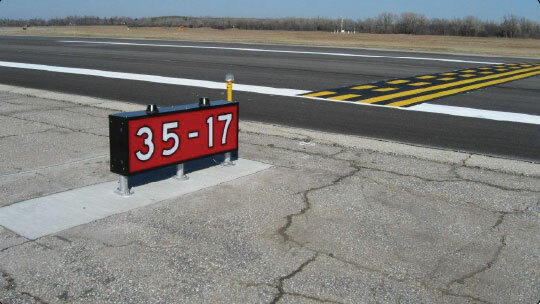 [Figure 14-15] The number on the signs indicates the distance, in thousands of feet, of landing runway remaining. The last sign, which has the numeral “1,” is located at least 950 feet from the runway end. Figure 14-15. Runway distance remaining sign indicating that there is 2,000 feet of runway remaining. 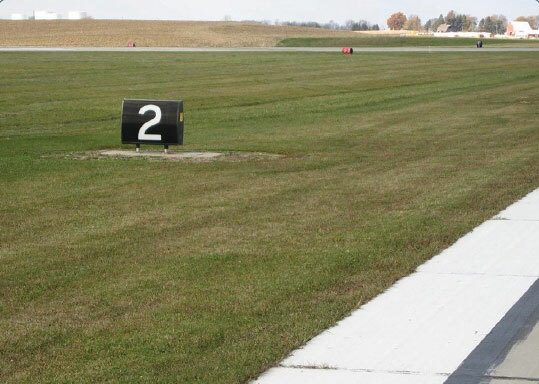 Runway numbers and letters are determined from the approach direction. The runway number is the whole number nearest one-tenth the magnetic azimuth of the centerline of the runway, measured clockwise from the magnetic north. In the case where there are parallel runways, the letters differentiate between left (L), right (R), or center (C). [Figure 14-16] For example, if there are two parallel runways, they would show the designation number and then either L or R beneath it. For three parallel runways, the designation number would be presented with L, C, or R beneath it. Figure 14-16. Two of three parallel runways. When simultaneous operations (takeoffs and landings) are being conducted on intersecting runways, Land and Hold Short Operations (LAHSO) may also be in effect. LAHSO is an ATC procedure that may require your participation and compliance. As pilot in command (PIC), you have the final authority to accept or decline any LAHSO clearance. If issued a land and hold short clearance, you must be aware of the reduced runway distances and whether or not you can comply before accepting the clearance. You do not have to accept a LAHSO clearance. Pilots should only receive a LAHSO clearance when there is a minimum ceiling of 1,000 feet and 3 statute miles of visibility. Figure 14-17. Runway holding position sign and marking for LAHSO. The holding position sign has a white inscription with black border around the numbers on a red background and is installed adjacent to the holding position markings. If you accept a land and hold short clearance, you must comply so that no portion of the aircraft extends beyond these hold markings. If receiving “cleared to land” instructions from ATC, you are authorized to use the entire landing length of the runway and should disregard any LAHSO holding position markings located on the runway. 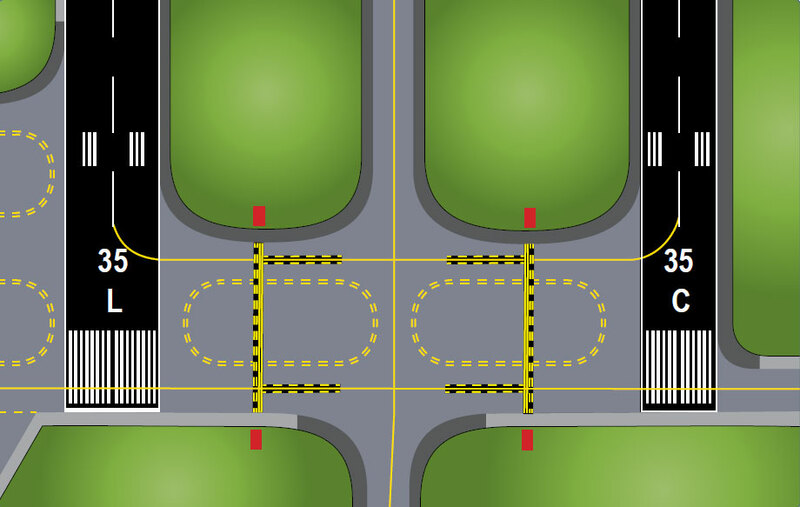 If you receive and accept LAHSO instructions, you must stop short of the intersecting runway prior to the LAHSO signs and markings. Below is a list of items which, if thoroughly understood and complied with, will ensure that LAHSO operations are conducted properly. Be advised by ATC as to why LAHSO are being conducted. Advise ATC if you cannot comply with LAHSO. Know what signs and markings are at the LAHSO point. LAHSO are not authorized for student pilots who are performing a solo flight. At many airports air carrier aircraft are not authorized to participate in LAHSO if the other aircraft is a general aviation aircraft. Generally, LAHSO are not authorized at night. LAHSO are not authorized on wet runways. If you accept the following clearance from ATC: “Cleared to land Runway 36 hold short of Runway 23,” you must either exit Runway 36 or stop at the holding position prior to Runway 23.